If you've been waiting for a raw food bar that not only has more protein than most raw bars, but also TASTES differently than the others you may have tried before (most of which all have that same familiar flavor of date paste and not much else! ), then prepared to be wowed by Raw Rev Glo bars, a new creation from Raw Revolution! High protein, high fiber, low sugar and packed with raw superfoods, these bars are made using only organic and GMO-free ingredients, and they provide dense nutrition to provide sustained energy for your busy days and nights. Each bar contains easily digestible plant based proteins, amino acids and trace minerals to keep your body lean and active, and they also contain omega rich organic chia, almonds, organic flax seeds and mineral rich sea salt for GLOing health. 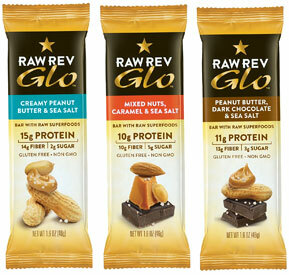 All Raw Rev Glo bars are 1.6 oz. (46g). Normally $1.99 per bar, now on sale for $1.49! From Chris of Freehold, New Jersey on 6/3/2015 . They just like the name I guess? But things like peanuts, pea protein, brown rice syrup, chocolate chips, etc., are not raw. Some of the stuff in these bars is raw. Much is not. I'm sure they're good. But you really should not call or consider them to be raw food.